The daughter of a professional musician, Perri Knize was raised in a home saturated in classical music, but years have passed since she last played the instrument that mesmerized her most: the piano. Surprised by a sudden, belated realization that she is meant to devote her life to the instrument, she finds a teacher and soon decides to buy a piano of her own. The seduction is complete. But the piano far exceeds Perri’s budget. She takes a wild leap of faith, refinancing her modest home in Montana, and remodeling her living room to accommodate her new instrument. But when the piano is delivered, and at last she sits down to play, the magical sound is gone, and the tone is dead and dull. Devastated, she calls in one piano technician after another to “fix” it, but no one can. So begins the author's epic quest to restore her piano to its rightful sound, and to understand its elusive power. This journey leads her into an international subculture of piano aficionados—concert artists, passionate amateurs, dealers, technicians, composers, designers, and builders—intriguing and eccentric characters all, whose lives have also been transformed by the spell of a piano. In New York, she visits the high-strung technician who prepared her piano for the showroom, and learns how a wire tightened just so, or an artfully softened hammer can transform an unremarkable instrument into one that touches listeners to their core. In Germany, she watches the workers who built her piano shape wood, iron, wool, and steel into musical instruments, and learns why each has its own unique voice. In Austria, she hikes into the Alps to learn how trees are selected to build pianos, and how they are grown and harvested. Always she is listening for the bewitching tone she once heard from her own grand, a sound she cannot forget. With each step of her journey, Perri draws ever-closer to uncovering the reason her piano's sound vanished, how to get it back, and the deeper secret of how music can lead us to a direct experience of the nature of reality. Along the way, she—and her readers—find that reason can’t account for what calls to us, but heeding that call can lead us to life’s most profound experiences. 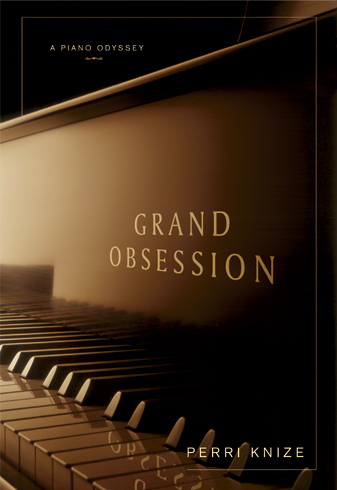 Beautifully composed, passionately performed, GRAND OBSESSION is itself a musical masterpiece.